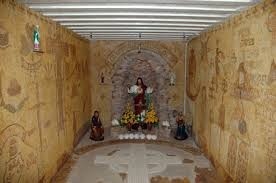 The Le Galloudec Shrine stands in the bank at Fort Hommet in the Castel, which was turned into a war bunker during the German Occupation of the Second World War. It was built by islander Hubert Le Galloudec, who began work in the 1950s with only a small lamp, some shells and a pot of glue. 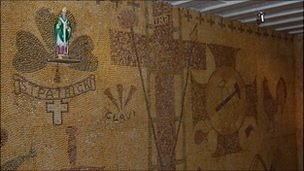 The walls of the bunker are covered in tiny shells, which form a mosaic of images from the Bible, including the Ten Commandments on tablets of stone, the Tree of Life from the Garden of Eden, and Noah’s ark. 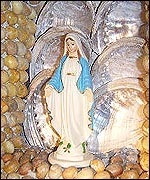 Small statues of religious figures such as the Virgin Mary also look down on the masterpiece. Vandalism meant it had to be closed in 1971 but the Friends of the Le Galloudec Shrine opened it to the public in the summer of 2008, after a team of volunteers painstakingly restored it back to its former glory for visitors to behold.